For the fall season, Nike Sportswear will be releasing their newest version of the Lunar Force 1 Duckboot. Two of the first two pairs to release will be the “Triple Black” and “Medium Olive” (shown here) color options. 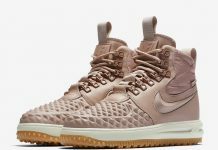 The new Lunar Force 1 Duckboot keeps you protected all season long, constructed with a durable upper and a rugged outsole fit for all terrains. The design takes on a fitting natural-toned look for its latest release, colored up in Medium olive, Wolf Grey and Black. Look for the Nike Lunar Force 1 Duckboot “Medium Olive” to release on September 15th at select Nike Sportswear retailers and Nike.com. The retail price tag is set at $170 USD.